Hi friends! I hope you had a wonderful weekend. It was sooo cold here in Columbus; I’m anxiously awaiting the real arrival of spring, although at this rate I’m thinking we may skip spring and go right into summer! When it’s cold out, I have the perfect excuse to do crafts, while staying warm and cozy in the house! I’ve seen a variety of painted kitchen utensils on Pinterest through the years and making my own has been on my project list for ages. Well, this chilly weekend I am finally able to check them off of my to-make list. 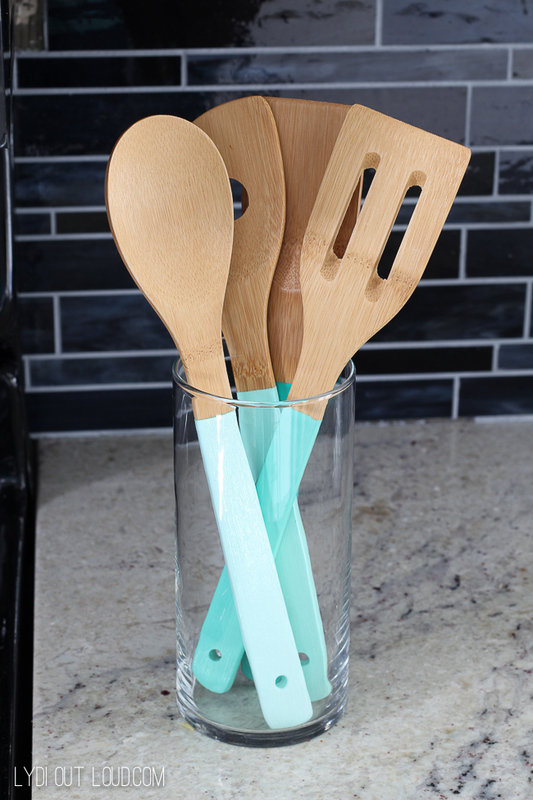 I’ve been adding aqua and teal accents to my kitchen over the last few months so I decided to go with that color scheme for my kitchen utensils with an ombre flair (I’m an ombre fanatic!) These were so easy to do and I love the pop of color they add to my kitchen. Let’s get you set up so you can make your own! 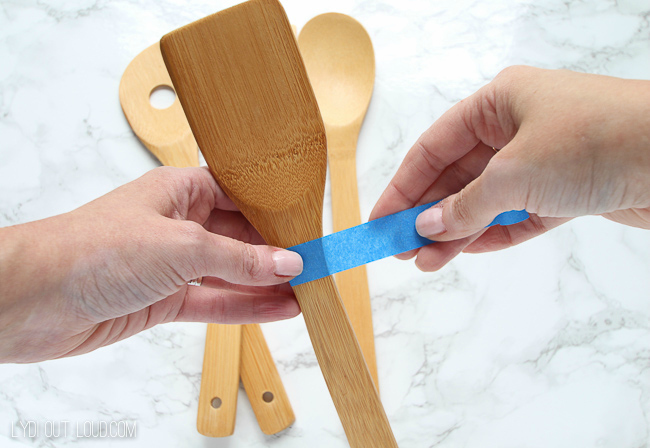 Start by taping the kitchen utensils. Tape just below the head of each utensil, ensuring that the tape is tightly wrapped so that no paint seeps underneath. 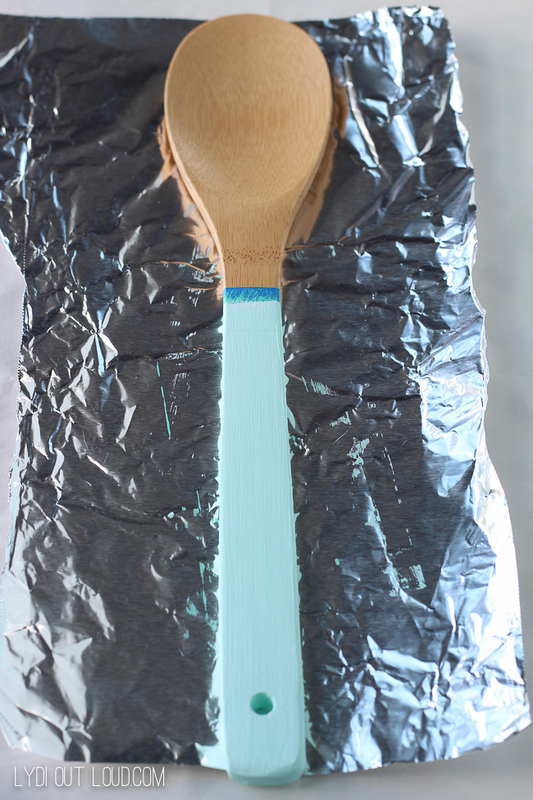 I’ve done ombre projects several times and I find it easiest to start with the lightest color of the ombre spectrum. 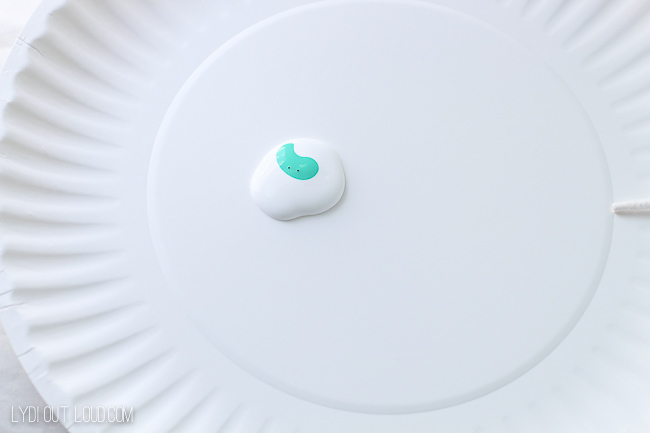 For the first utensil, I used around tablespoon of white paint with just a drop of the teal mint paint (or whatever color you choose). No fear, we’re not baking so no need to do precise measurements, you can just eyeball it. I snapped off the end of a cotton swab to mix the colors together. 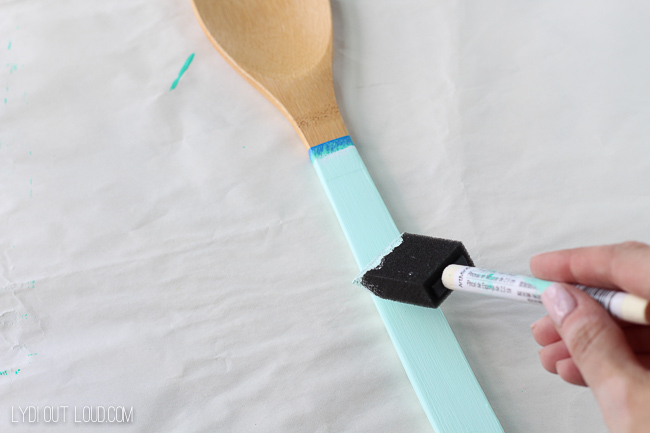 Using a foam brush, paint the sides and top of the utensil handle. 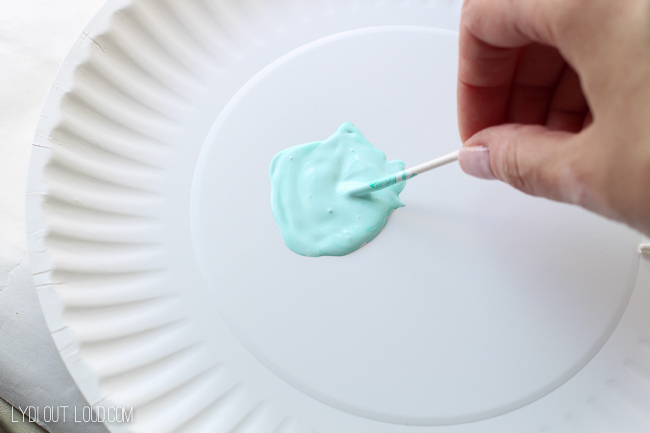 Use the cotton swab stick to rim the inside of the utensil hole with paint. I like to set my painting projects on aluminum foil to dry, that way the paint doesn’t adhere to any pieces of paper. 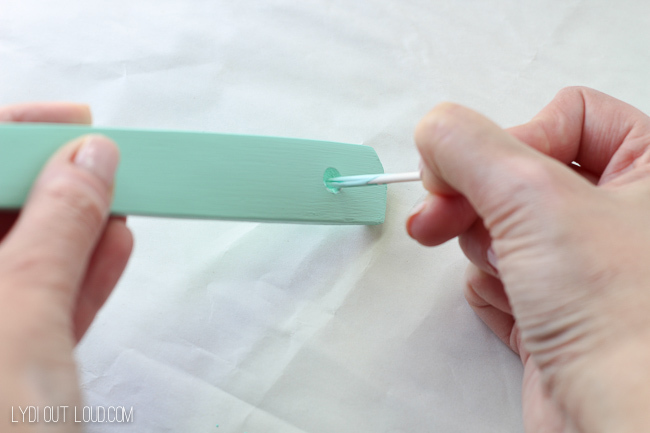 Allow to dry for 30 minutes, then paint the bottom of the handle. Allow to dry for another 30 minutes and then repeat the same steps for the second coat. For the second utensil, I used about a 2:1 ratio of teal mint to white, for the third I used equal parts teal mint and white and for the fourth I used straight teal mint. 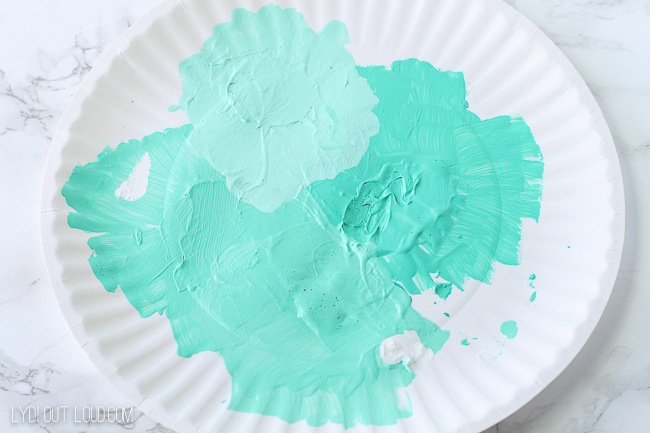 I find it helpful to continue to mix your paint colors on the same plate, that way you can really get a true idea of the shade range of your ombre. Once the brushes are dry, coat with 2 coats of sealer (wait an hour between coats) so that you can cook with and wash your kitchen utensils. I ditched my stainless steel utensil holder in favor of a clear glass vase so that my ombre utensils are in full view! These would make a great hostess or housewarming gift as well, tied with some raffia and paired with a kitchen towel or maybe a favorite recipe. Are you an ombre fanatic like me? 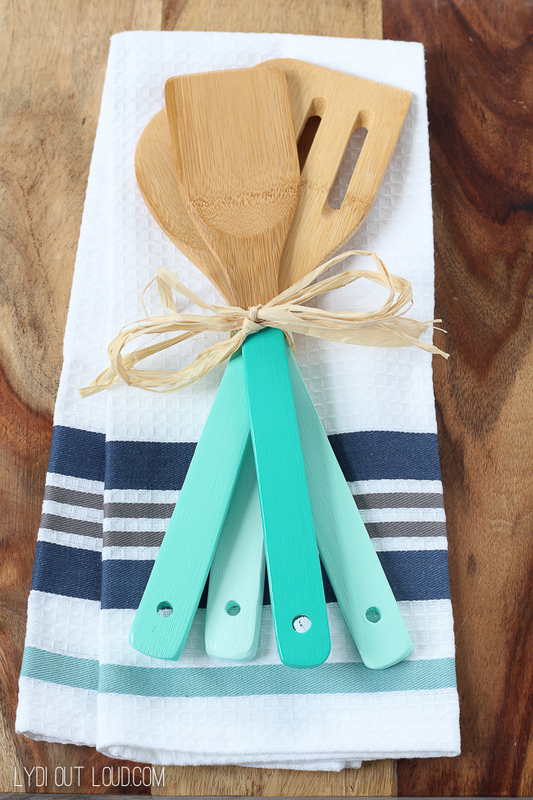 What colors would you choose for your ombre kitchen utensils? Thanks for stopping by and I hope you have a fantastic week! Linked up at The Creative Gallery! You had mentioned a sealer that you used. What was it? Any polyurethane sealer will work once it’s cured or dishwasher safe mod podge. I loved the bamboo utensils. In my house in New York, we have few bamboo trees. I think I can also make some wonder utensils. Wonderful information. I am sharing with my wife also. Keep it up your excellent work. Thanks so much Radif, I really appreciate it! Really it’s an amazing idea. I like your all utensils for the kitchen. It’s very beautiful to see. Thank you for shear a very helpful information about the kitchen utensils. Hey, i’m also an ombre fanatic! hope this procedure will bring a huge change in wooden utensils using experience. thanks for sharing this fantastic creative idea. Hey Lydi, I like your creativity! Thanks for linking up at Welcome Home Wednesdays! You’re my feature this week. Congrats! See you tomorrow! Love these! What a great idea for a shower gift! Love this project! Would make a great housewarming gift! Thanks Pam! I think it would be perfect for that too. Yeah, it’s absolutely amazing to see how such small ideas can bring a huge difference to the product. This could be a great gift, but it can also look great in our kitchen. These are so pretty! 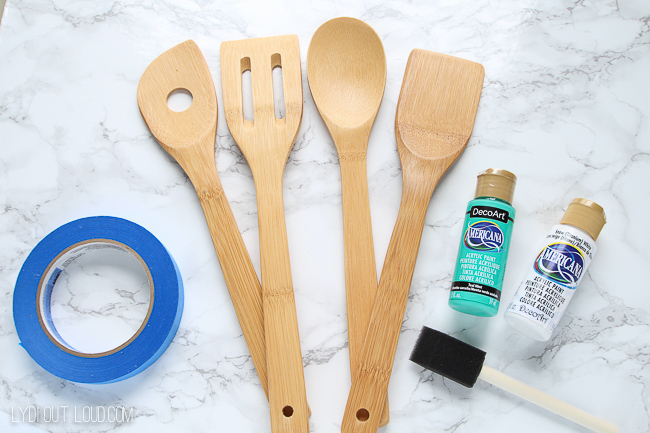 What varnish did you use, so the utensils are safe to use with food? Thanks Doreen! I used some sealer I had that I used to seal a butcher block. It’s called Watco and is a Rustoleum product. I love this idea. It’s so custom and unique. Sounds like a fun crafternoon Joyce! 🙂 Thank you so much!